Bhootera Sab Eikhane free ebook download pdf file. 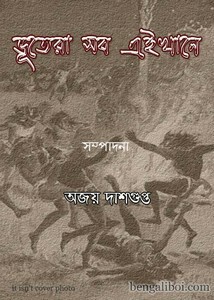 It is a collection of selected ghost stories, all these stories are written by various emient Bengali authors as Lila Majumdar, Ashapurna Debi, Bimal Kar, Maheshweta Debi, Arabinda Guha, Alok Sarkar, Kamal Laheri, Guru Bishwas, Sunil Jana, Subrata Raha, Amitav Basu, Ananda Bagchi, Shekhar Basu, Anish Deb, Kartik Ghosh, Avik Roy, Sudhindra Sarkar, Souren Mitra etc. And the book edited by Ajoy Dashgupta. The ebook pdf has 231 pages and 16mb pdf size.